Review - The Kingdom: FBI agents show the locals the American Way! The end of the Cold War saw Hollywood and America launch a frantic search for bad guys, bad guys that could be over come and defeated by American heroes. In the bargain, America, of course, would save the world and validate the truth of the American Way and the American Dream. In the Cold War it was the Russians, the Syrians / Arabs (check out True Lies) came next, and now it is the Al Qaeda and its free floating associates. 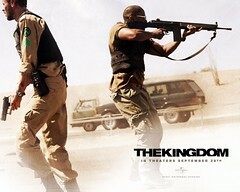 The movie is set in Saudi Arabia, the Kingdom in the title, with very few scenes in the US of A. Peter Berg is a director who seems to be very fond of hand held shots, and uses them liberally, with the result that camera shakes and actors sliding in and out of the frame becomes de rigueur in the film. This effect works well in the action sequences, and also helps in building tension in parts of the film, but overall it is a bit too much for the viewer. The script is predictable for the most part and has oft repeated themes in it. The Saudi police men and the American FBI agent played by Jamie Foxx (an African American, a casting choice possibly influenced by the need to be politically correct) are shown as family men, the Americans and the Saudis initially distrust each other but then bonding takes place, cultural gaffes and clashes are shown as the Middle East and America come together, and so are palace intrigues in the Kingdom. The Saudi police force comes across as professional, but rather hamstrung due to internal politics, while the Prince of the Kingdom sees every event as a photo opportunity. On the American side, it portrays politicians as the ones who prevent good Americans from doing their jobs; all of which are themes as old as Adam himself. But it is the Americans obviously who know what to do and how to do it, and it is they who end up doing what it takes to promote justice. The Saudi police are reduced to passive cooperators having accepted the superiority of the Americans. This part of the film moves as a FBI procedural, where the American agents demonstrate their technical expertise to catch the bad guys. The last half an hour of the film explodes into action and the script remains predictable throughout right up to the end, but the action is well choreographed, the intensity evident, and the actors look as if they are really fighting for their lives. The last five minutes of the film are a surprise; one does not expect such a comment from a mainstream Hollywood action film. But it is there, and this coupled with the decent acting and the last action set piece sequence lifts the film a notch above an average action thriller. FBI agents fly to Riyadh to investigate a terror attack on American citizens on Saudi soil. The last action set piece; the climax is well shot and has bombs exploding on the highway, cars tumbling and rolling like roulette wheels, and an all out fire fight with automatic weapons and rocket launchers running wild. Why should other nations and their people bar America, be depicted as ineffectual and possibly unjust? But is one asking for too much?